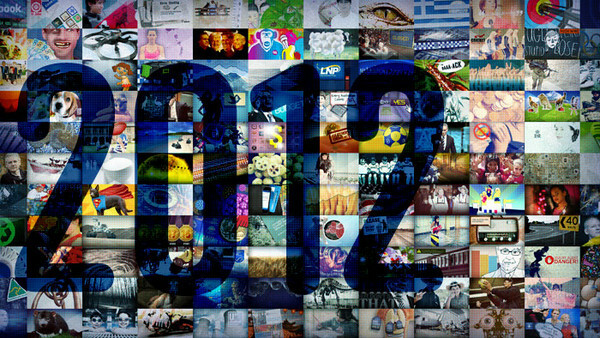 Since we are rapidly approaching the New Year many of the Social Media networks have worked to make a year in review to talk about some of the biggest events that have happened in 2012. Along with Social Networks making their year in review you can use tools to make your own year in review from Facebook and Twitter. 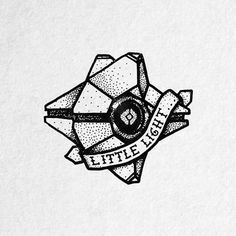 Google has its “Zeitgeist” which means “the spirit of the times,” and this spirit can be seen through the aggregation of billions of search queries Google receives every day. The annual Zeitgeist report reveals what captured the world’s attention in the past year—our passions, interests and defining moments as seen through search. At Google’s Zeitgeist you can find tons of information about what people searched throughout the year. According to Google there were 1.2 Trillion searches this year in 146 different languages. On their site you can see the top 5 trending in many different categories like; Searches, Images, Events, Films, and many more. At the Zeitgeist site you can filter the results by country or view the top searches in the world. Also on the site you can view a map with pins of the most important events in the year and where in the world they took place. 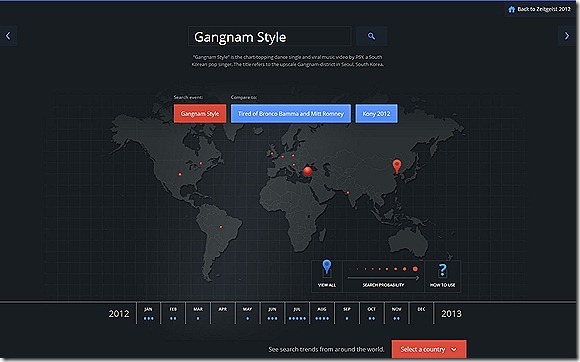 And when you select an event the map will show you what countries searched for that event. 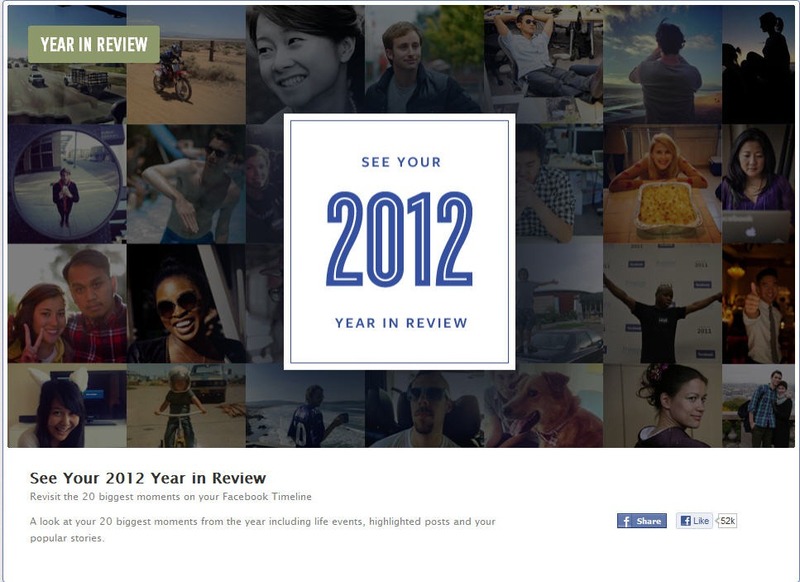 Facebook has created a year in review of sorts they have created the top 10 trends on Facebook for 2012 and they have a top 10 for many different subjects. 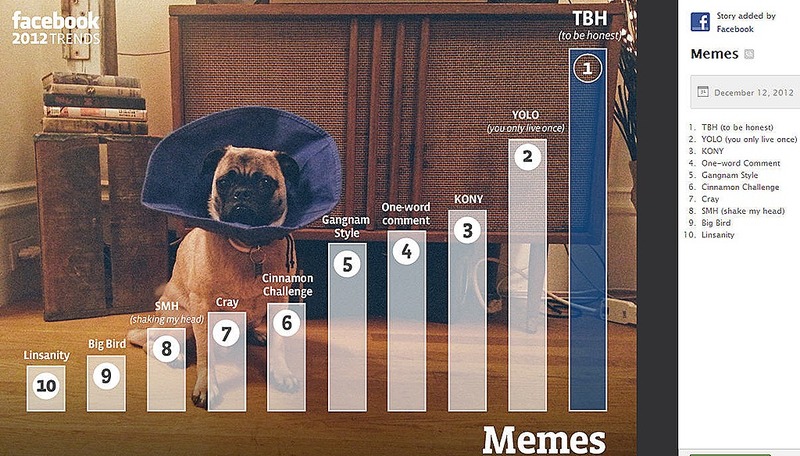 For the US Facebook has compiled the top 10 trends for Memes, Events, TV Shows, Movies, Talked about, and several other subjects. Facebook also has top 10 trending for other countries like Germany, Brazil, and several others. 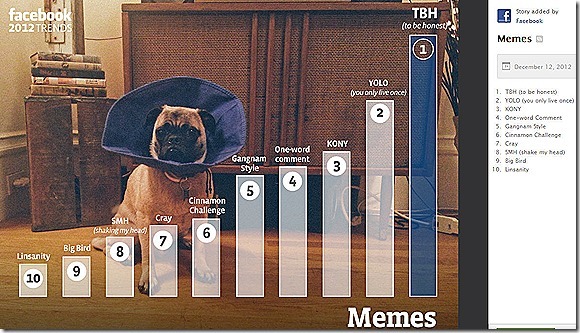 The top 10 trends were made into Memes and can be found at Facebookstories. You also have the ability to make your own Facebook trends of the year which will go through your timeline and find the 20 biggest moments of your year. Facebook does this through an app that you will have to give permissions to view your timeline but once you allow the app to run you will get your biggest moments on Facebook for 2012. The biggest moments are life events, posts you have highlighted, and your popular stories. 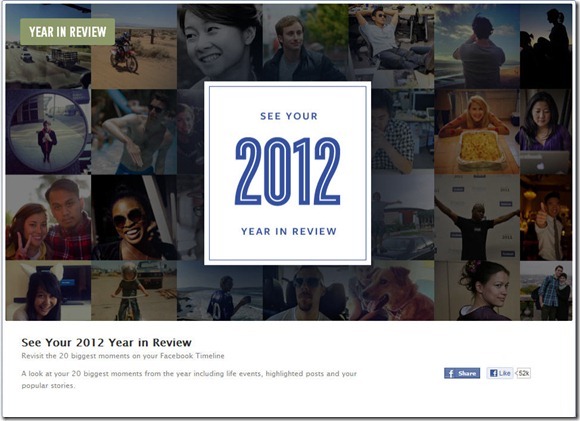 Once you have your top 20 moments you can share it on you Facebook Timeline. Twitter has many different takes on the year in review probably because it has so many users and so much data to go through. 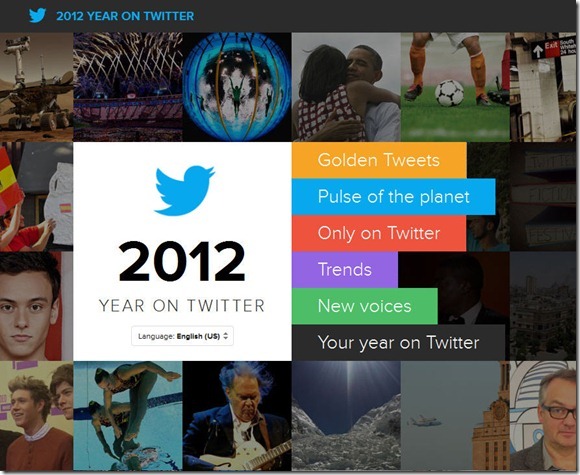 Twitter has a Golden Tweet which is the tweet during 2012 that was retweeted most. This year it was the tweet from President Obama saying 4 more years. Twitter also shows the pulse of the planet which are the biggest conversations of the year around single events that generate a large number of Tweets and Retweets. And these include events like the 2012 Summer Olympics, and Superstorm Sandy. Twitter also lists the top trends for several different subjects. The 2012 Trends reveal what captured our attention, rather than what terms were consistently popular. Twitter’s new voices are a collection of high-profile Twitter users who joined in 2012. Some of the people who joined in 2012 include the Pope, PSY, and Betty White. 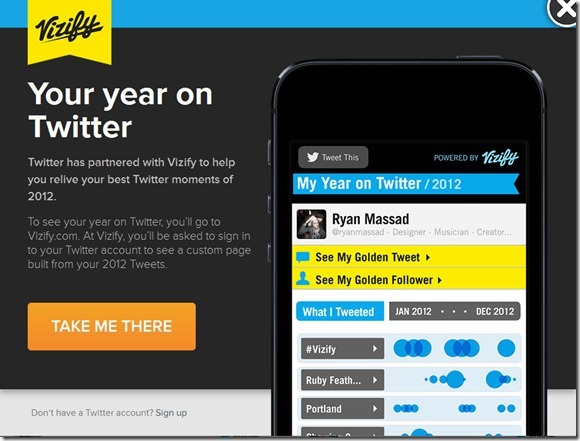 Twitter partnered with Vizify to show you your 2012 on Twitter which has your Golden Tweet and Golden Follower which are the most retweet post of yours and the Twitter follower of yours that has retweeted the most. This is always interesting to see what topic of yours was most popular and which one of your friends follows you the most. To find out more about each of this year in reviews you can follow the links below.